Easy-care, all-season color. 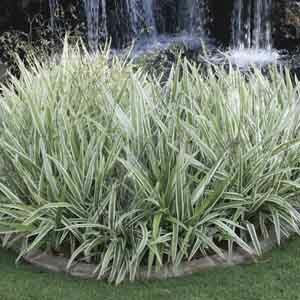 Flax Lily’s sword-like leaves edged with white add great texture and sparkling contrast when planted near dark-leaved shrubs, broad-leaved plants, or bright flowers. Loose sprays of starry-purple flowers are followed by attractive black berries. Good for borders, a spectacular massed display or potted up in containers. Looks great in woodland settings. Makes a striking accent plant. Very nice for planting around swimming pools. Best in acidic, humus-rich soil. Tolerates drought, but looks best with regular watering. Apply a balanced liquid fertilizer monthly. Will tolerate more sun in cooler climates.